[/symple_box]Oops. I missed a day in this series because the paper mache horse had to spend the night in the ER with a cast on her ankles. The plaster board legs were, (I now realize), a bad idea. 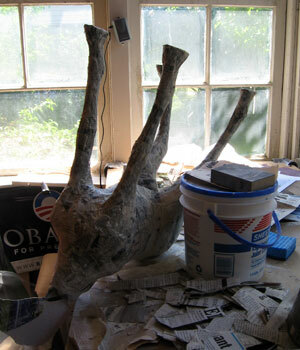 Fortunately, even when things break with paper mache you can almost always fix it. The water in the joint compound soaked into the plasterboard, and then migrated towards the lower section where the legs are really thin. I felt the rump area and it seemed to be dry, so I started sanding the rough spots. This giggled things a bit, and caused enough stress for the still-damp back legs to bend, just above the hoof. 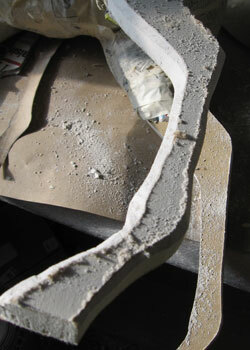 I caught the problem in time and wrapped the area in paper mache strips, which I then allowed to dry overnight. No need to shoot the horse and start over. Two days ago I attached the plaster board legs, and in this photo you can see that I rounded the corners with a serrated knife. This is something that needs to be done very carefully. You don’t want to slip and slice off your thumb! I now added joint compound. I could have been a little neater about it, but it’s kind of like frosting a cake. Once the ankle casts were hard and the joint compound was completely dry, I sanded the rough spots off the legs. At this point I’m not worried about getting things “right.” There’s still a long way to go before this appaloosa colt is finished. The only thing that matters at this point is to not have anything sticking out that will need to be cut off later. Adding more material is easy – removing excess material can be done, but it’s a lot more work. 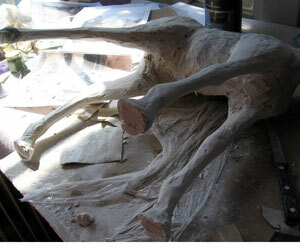 The legs have now been wrapped with the first layer of paper mache. I will use at least four more layers, using brown paper. Since paper mache is as strong as wood, I think this will be adequate. I’m letting this layer dry with the legs up in the air because the water from the paste will soak into the layer of joint compound underneath, and it may weaken the legs again. As soon as this layer is completely solid I’ll add a few more layers of brown paper, and begin to model the head. Since the piece won’t fit into my oven, it will take a while to dry so it may be a few days before I can do another post. I’ll see you then. 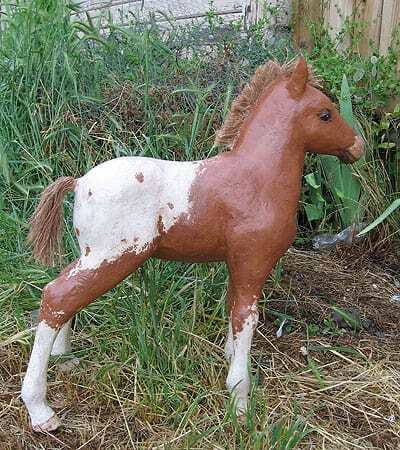 Can you make a video on how to make a paper mache horse? I just want to learn more in paper mache. I think that’s the only way for me to learn, haha! Do you find joint compound to be weak? I’m teaching paper mache to a class of 11-12 year olds. We are coming to the point where we need to put details on. I’m trying to decide if I should use joint compound or a mix of paste and boiled newspaper. Do you have any thoughts or ideas to help me? Thanks! Hi Kemberlee. The joint compound doesn’t have any structural strength, so it does need a firm backing. If you used an armature that stands by itself, the joint compound will work just fine. You will want to let it dry completely and then cover it with at least one layer of newspaper strips with paste to protect it. I will do almost anything to avoid using paste and boiled newspapers. But some people like it. In a few minutes I’ll have a paper mache clay recipe up on my blog that is easier and more fun to use, but it does cost more. -edit – The paper mache clay recipe post is now live. Would you still reply to this??? My cardboard armature is weak. How can I make it stiff and sturdy???? One thing that helps is to have the corrugations go up and down on the legs, instead of sideways. This stiffens the cardboard a lot. You can also double up the cardboard and glue the pieces together, which will help. You can use a heavy piece of wire going up the legs and under the belly, which will reinforce the ‘bones,’ and you can use crumpled aluminum foil to fill out the forms on the legs instead of crumpled paper. Crumpled foil is incredibly strong. oh tht’s grt .. it wud be nice to learn to make a halloween mask. Sorry for asking soo many questions but im doing paper mache for the first time n tht too for an event where i have to make about 5 horses n 5 camels and put it on display for the public so im a little neurotic and want it to look like a perfect horse. Im so glad to have found your site, i really appreciate your work and truely inspired by it. Wow – you signed up to make 10 paper mache animals? I’m impressed. And don’t worry about the questions – that’s what this blog is for. I’m just sorry you had to start on the one critter that doesn’t have a proper tutorial. Someday I will make one. hi, im a little confused about the joint compoud adding step. First you used joint compound to finish the modelling of the muscles on the legs. I wanted to ask did u use the compound on the legs only after the 1st layer of paper mache on the torso? So u just made a paste and applied it n let it dry? And after the leg broke u added joint compound once again. 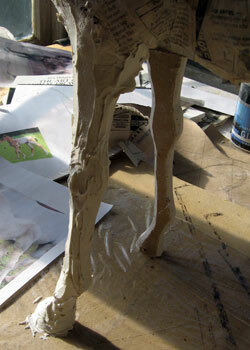 So shall i too use 2 layers of joint compound or just do it once n shape the legs up and then paper mache them? The joint compound is just an easy way to make a paper mache sculpture smooth, instead of having the bumps and valleys you get when you build something out of crumpled paper and masking tape. So go ahead and use as much joint compound as you want – but make sure it dries completely before covering it with your final layer of paper mache. Your work is amazing! I really love to watch the steps as you go. It’s so neat to watch a piece come to life! The rebar idea is a great on for strength. Just anote though. Rebar rusts…and it will rust through paper mache, the stuff seems to migrate. Nothing worse than having rust show up late in the game, and its hard to cover. So before you use it you might want to coat it with urethane or something to seal it and prevent rust from turning up on your lovely sculptures. Thanks so much for a lovely and informative website!